Online pinboard Pinterest is the new hotness. VCs are piling in because it is growing like crazy. How crazy? According to comScore, Pinterest generated 421 million pageviews in the U.S. in October, up 2,000 percent since June when it was at an estimated 20 million. Pinterest, which is still in an invite-only beta, has already surpassed the U.S. pageviews of much more established sites such as Etsy (which grew a healthy 47 percent since June to 348 million pageviews in October). I am comparing Pinterest to Etsy because, while one is an ecommerce marketplace and the other is more of a crowdsourced catalog, they both seem to appeal to the same types of people—mostly women interested in design, fashion, and quality products that are not mainstream. Also, from what I can tell anecdotally, Etsy items are very popular on Pinterest. All of those pageviews are coming from a relatively small number of users. 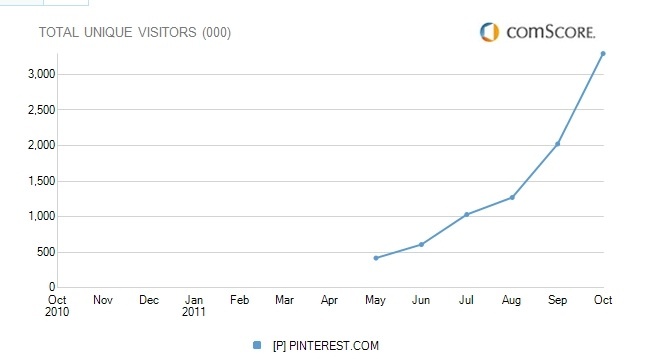 In October, Pinterest had an estimated 3.3 million unique visitors in the U.S., up more than fourfold since June when it was at 608,000. On average, each person on Pinterest generates 128 pageviews a month (a number which will no doubt come down). It doesn’t yet have many users, but they are addicted to the service, which encourages you to “repin” other people’s image-heavy Web clippings (which is like reblogging on Tumblr and similarly generates a ton of internal pageviews as people jump from pinned image to pinned image). Since so much of what people organize and pin on Pinterest are products, the site is essentially collecting a lot of commercial intent and is in a position to know what types of products to recommend users or what types of ads/deals to show them in the future. But people don’t search on Pinterest. It is a place to discover new products. My wife is one of those addicts. She is on Pinterest every day, which tells me something. The early adopters are not your typical tech-obsessed early adopters. Investors see the same trends, which is why they think Pinterest is only at the early stages of its growth. Update: These numbers are just estimates from comScore,and as such are not perfect. But at least they are apples-to-apples. Etsy says its internal metrics show 1.2 billion pageviews in October. 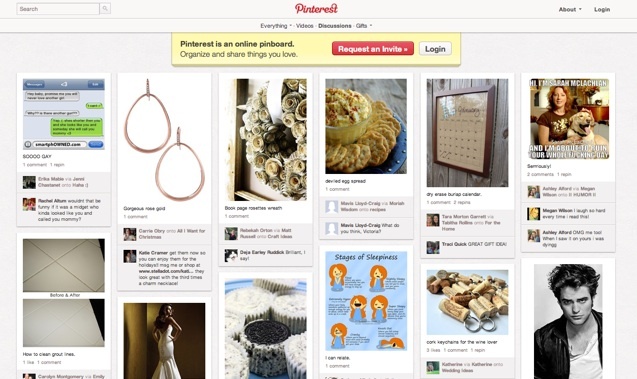 Pinterest does not disclose its internal numbers.